Mr. Dominant, mockster, thirdengine and 49 others like this. If anything he replaces Ennis in the rotation spot, and that is something I am very okay with because honestly - Ennis was trash defensively. jsilencio, Mr. Dominant, dkim1984 and 25 others like this. Lol... we only discussed it for like 100’s of pages in the Shumpert and luxury tax threads. macho GRANDE, ElDobleK, Tankeio and 34 others like this. AceOfSpades, douglasreedy1, Vivi and 9 others like this. Say what you want but Shumpert has NEVER done anything since he been in the league. He has always been a below average offensive player. Actually, I thought Ennis was coming around before he got traded. Mr. Dominant and Rocketeer4Life like this. Hey, you know what's fun? Rehashing something that's been pounded into oblivion in like 4 other threads. You think you're saying something different from what everyone else is saying, but you really aren't. Reeko, don grahamleone, D-rock and 10 others like this. Clips/Roxfan, dkim1984, Bo6 and 24 others like this. Williamson, don grahamleone, D-rock and 4 others like this. our offensive strategy is 3s and points in the paint, and we need more depth at the wing who can do that at a high percentage. our defensive strategy is versatile small ball lineup who can guard up and down, which means we need wing players who can guard 1, 2, 3, and maybe even 4. Shump can give us versatile defense at the wing, guard multiple positions. we need more time to integrate him on the offense, so he can shoot the 3s in rhythm. in theory, if he does, he can be what Ariza/Mbah a Moute did for us. Red Chocolate, sammy, don grahamleone and 3 others like this. Thank you. Ludicrous to judge Shumpert on his first game with the squad. dkim1984, don grahamleone, D-rock and 6 others like this. Seen this several times and every time I'm confused by why Tillman would be holding up a jersey with PJ Tucker's number on it. Weird choice. don grahamleone, psingh34 and Smacktle like this. Another nomination for the worst post of the week. hakeem94, Vivi, Smacktle and 2 others like this. sammy, RichieBanks, BasketMAD and 3 others like this. At the beginning, I thought Morey made mistakes. 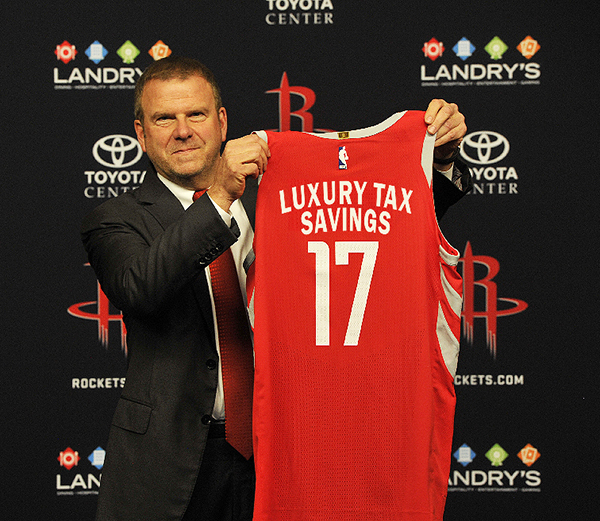 The reason Morey did not make the trade could be luxury tax next year. We got rid of a first round pick. We don't need those. I'm happy to be wrong here and Shumpert turns out to be godsend, but if Iman Shumpert is all we get out of what we did at the trade deadline, I think we were better off doing nothing, and keeping the first rounder & better 2nd rounders. And if you are doing the deal for Shumpert because you love him so much, there's no reason to just give up potential real NBA players like James Ennis and Nick Stauskas. Haha... EXACTLY. We traded for a guy to play that role who is .... well... Too short & not long enough to play the role we need him for. It's pretty bad when someone is geting the Ariza treatment who can't even do what Ariza did.